Frocktails is nearly here. I’m off to Melbourne on Friday! I love how this dress fits and am always amazed that just two pieces of fabric can manage to look so damn fine. 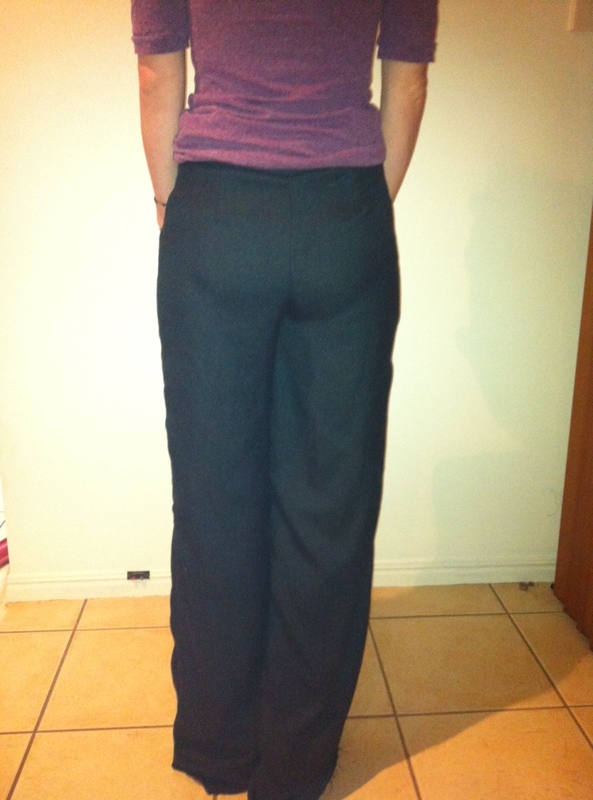 Back view of the Clairy – there is a seam from the lower back to the hem, a seam across my lower back and side seams from the armholes to the hip, extending slightly below the back waist seam. Clairy is not immaculately finished… she’s a rough & ready gal. I am ridiculously busy at the moment with little or no spare time… it’s frustrating but this is the busiest time of the year for me. Work, kids, family, drama, dance, gym, trips away. It all happens from September until December. And then listen to Love Letter. Awesome song. I’ve been away for a week in Tasmania. Just a quiet week, not too much sightseeing as I’ve been to Tasmania five or six times now! The holiday house is located in the central highlands of Tasmania, it’s in a little town which is basically composed of little holiday houses and very few permanent residents, it’s trout fishing country so many are shacks more than houses – quite quirky and charming in their ramshackle way. Most of the clothes I wore on holidays were made-by-me. I’m never sure if it’s the novelty factor of wearing my made-by-me clothes or just that they are nicer than my RTW that means they are always my first choice in the morning. 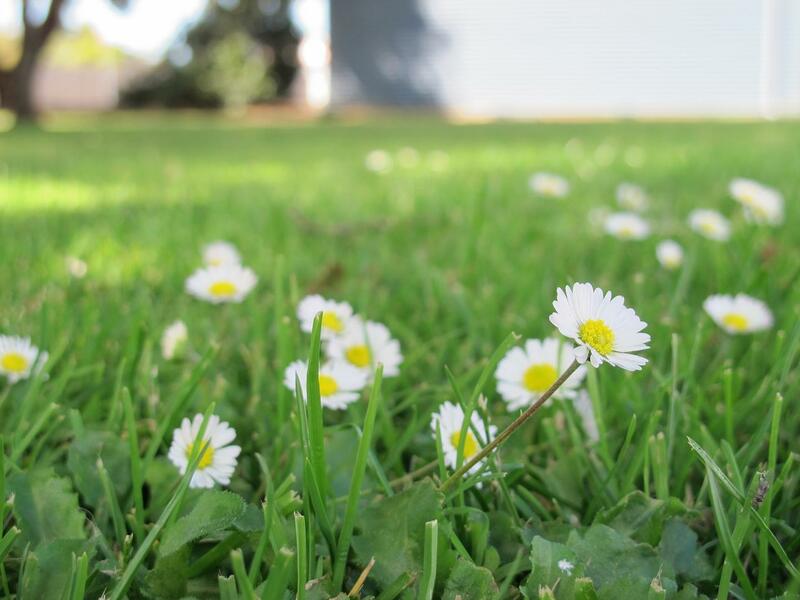 The nicest thing happened in Deloraine, Tasmania. I was wandering along the main street, wearing my Lonsdale with red flats and my Whole Wheat slung over my arm. A little elderly lady was sitting in her car, she flung open her car door and stopped me to tell me how gorgeous she thought my clothes were – that I was ‘quite the picture’. Once I explained I made my clothes, we then had a lovely chat about how much she adored making her own clothes too. That was a real holiday highlight for me! My MariaDenmark and Sewaholic clothes got a lot of wear – and my Whole Wheat cardigan, my first knitted project in YEARS was in regular rotation. We took some lovely pictures in the caves but WordPress keeps reverting them to the wrong orientation. *sigh* patience required. You will notice a new little skirt has popped up. This is the Maria Denmark Yasmin Yoke skirt.. It’s a simple make and very easy to fit as you go along. I’m not thrilled with this fabric although I like the pattern. The fabric is a butter suede and while it looks and feels lovely from the outside, it’s a bit ‘sticky’ on my skin – it really needs to be linted (note to self: remember that when you use the blue butter suede in the stash!). I think I will try making this up in some lightweight demin, it’s very easy to wear as it doesn’t sit too high on your waist. I also made up a black/white stripey top from Maria Denmark’s Birgette pattern. I cheated on this t-shirt. I made it from a $1 skirt I picked up at the school fete. It was a long tube skirt and too big for me. I cut the body pieces so the skirt hem was the t-shirt hem. I also have not bothered to hem the sleeves. I don’t think this sort of stark stripe is my thing, it’s a bit harsh. Anyway for $1 I’m not too perturbed – I love the t-shirt pattern, I like the negative ease. We saw lots of little creatures in Tasmania. It really is the place to see Australian wildlife, once you get away from the towns and cities. 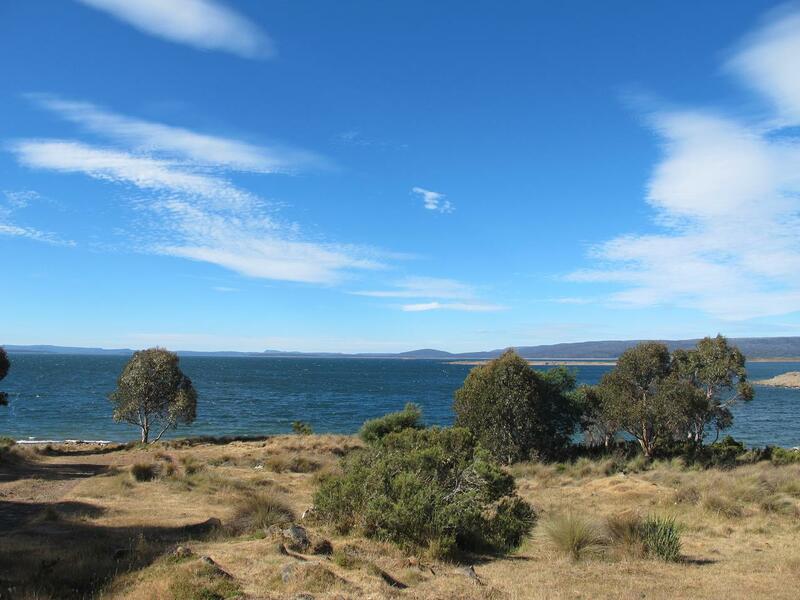 On the way to house on the first night we saw four Tasmanian Devils, a Spotted Eastern Quoll, countless wallabies, two wombats and more – meaning we had to drive slowly to avoid hitting them! No doubt they were driven to the roadsides in search of food as much of the country we drove through once we got the to Great Western Tiers which has suffered in the recent bushfires. The above dress is my second Maria Denmark Day-to-night dress – I found this amazing knit at Lincraft, it’s a rayon knit, lovely and light (and it was half price in the recent sale). It was intended to be a Sewing Cake Tirsmisu – and while there are so many lovely Tiramisu’s out there in the blogsphere, I’ve yet to find a fabric that screams Tiramisu to me. SewImpatientLizzy! I’ve worn this dress a lot, out and just around the house, it’s so comfortable and flattering. And yes, it really takes about 60 minutes to make! Sewaholic Cambie and Whole Wheat cardigan. This is waaay to early in the morning for me. PLus I didn’t take a hair dryer away – yes! A real holiday!! I nearly finished a cardigan for my daughter – I’m knitting the sleeves now and then just the button bands to go. This pattern is Langston from Ravelry, a really sweet little cardigan. I knitting it with a Paton’s wool called Romance. It’s a yummy merino/cashmere blend and I picked it up at Lincraft just before I left for holidays. It was marked down from $9 a ball to $3.99 – like it’s meant to be. I started it once I got through airport security with my needles, I was worried some nasty airport man would make me rip the knitting off! I’ve learnt so much about knitting in the last month. Thanks to YouTube and Google, I’ve mastered cables, SSK, the Magic Loop technique and more. If you can knit plain and purl stitches but think that knitting a cardigan or jumper is beyond you – it’s not true. I watched several YouTube videos and have vastly increased my knitting abilities. Don’t underestimate yourself. If you are determined you can do anything! Ravelry has been a relevation to me. It’s like facebook for knitters and crocheters, an amazing source of inspiration, patterns (lots of free ones at that!) and more. It’s free to join so if you are curious go and have a look! And you can friend me – my name is SewBusyLizzy (yes I’m imaginative!). I arrived home to the most amazing package from Blogless Anna (go and check out her adorable parrot blouse). 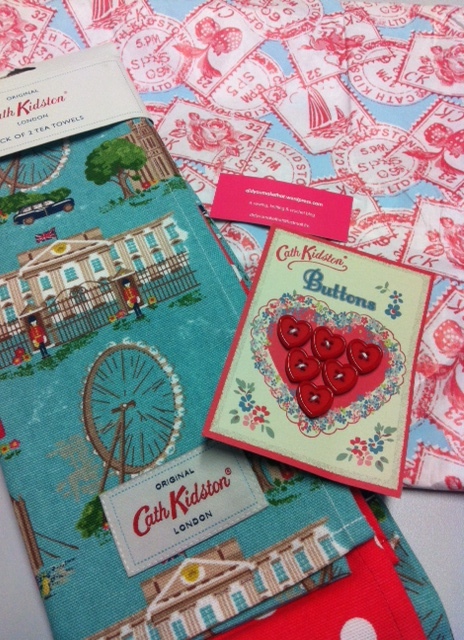 I’m actually speechless – she sent me some fabric which she picked up at The Fabric Store’s recent sale. She said she got it home and realised it wasn’t her. So she sent it to me – it’s SoSewBusyLizzy that I’m refraining from wrapping myself up in it and rolling about on the floor. Thank you Anna – I adore it!! I have a couple of ideas how I’m going to use it… once I stop patting it. So things gotta little outta hand on Twitter the other day and the sewing Tweet Peeps started to throw #sewingdares around the globe – nothing scary – just little challenges to shake up our sewing worlds. So what dares are floating about out there? And who is to blame for such craziness? Gillian of Crafting a Rainbow of course – she who threw us into the Top 5 of 2012 frenzy! Read more about #SewingDares here… perhaps you want one? Hack a favourite pattern into something new. And Ooah suggested I hack Maria Denmark Day/Night Cowl top into a dress. Some suggested I just lengthen the top and turn it into a dress… however I had just cut out the Dress of Legend – Vogue 1250. It occurred to me that the way this dress is constructed is the secret to it popularity and flattering shape. I decided I could use that as inspiration to hack my beloved cowl neck pattern into a dress which had similar properties to The Dress of Legend. If you haven’t made Vogue 1250 – The Dress of Legend (I think I was the last blogger ever to make this) – it had just three pieces… a front piece, and upper back piece and a back neck facing piece. “but what covers the junk trunk SewBusyLizzy? ?” I hear you cry. The front piece wraps around from the waist down to cover the junk trunk (consider them junk trunk flaps). There is a centre back seam over the junk trunk and your back is covered by just one pattern piece. The famous Vogue 1250 – sorry a very tired SewBusyLizzy picture after work and drinks. I lengthened the Maria Denmark Day-to-Night top in a similar manner – adding junk trunk flaps. I shortened the back piece and scooped it. The hacked Maria Denmark Day to Night dress – forgive the messy side, I haven’t trimmed the side of the pattern piece which sits on the fold. Messy Girl! As my pattern pieces require no back neck facing as I simply finished the back neck and armholes with invisible elastic – so there are just two pattern pieces. Vogue 1250 has three. How do the two dresses compare? Well I like the blue fabric of the Vogue better – however I prefer the construction of the Day to Night dress, the overall shape, the cowl is much easier to construct and it’s also got more fabric in the cowl and the inside edges of the cowl don’t peek out the way they do in the Vogue. Plus this is a better size for me. The smallest size of the Vogue just feels too roomy across my shoulders and I feel a little swamped. I think I might re-make my pattern hack again. In the blue fabric, fiddle with the side pattern pieces, shorten the back piece a little. This is more my kinda dress than the Vogue dress. It feels younger, funkier and less fiddly than the Vogue. The fit is much better. I’ve told you before – you NEED this pattern. Maria Denmark – Day to Night Top. This pattern is SOLID GOLD. Easy and looks fabulous. OMG I love this top and and I love this pattern. 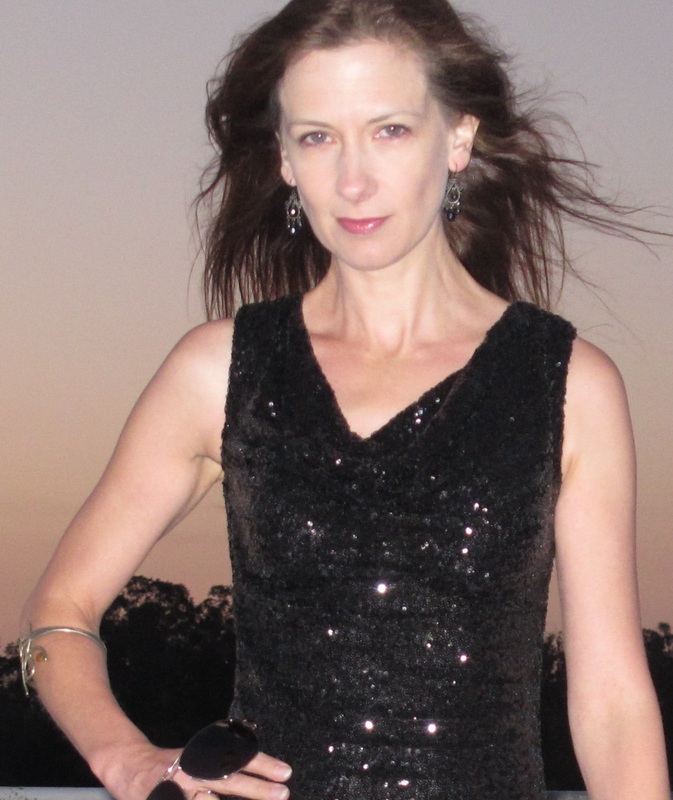 It’s MariaDenmark’s Day to Night Drape Top. I made it this morning and wore it today. Seriously, it’s that quick and easy. Two pieces to cut out. Elastic for the back neck line and armholes and you are done. “Oh no it’s a PDF pattern” I hear you cry. Yeah… get a grip. If you are clever you just have to stick six pieces together for the top and six pieces together for the back – if that’s too much of a challenge I can lend you my 7-year-old, she’s a whizz with scissors and tape. Trust me, it’s not one of those enormous jigsaw puzzles that gets completely out of whack by Sheet 30. And these patterns do not have a lot of ink on the page so that’s no excuse either. PDF patterns can be a mild challenge but so can wrestling fragile tissue paper back into an envelope. It’s just a different challenge. Get outta that comfort zone I say! I’ve also got smart about these non-seam allowance patterns. I have a little two pencil tool which I use to trace around the pattern. I then cut out from this second line – so I don’t have to think about it as I cut and sew (cos I am a bit of a dunderhead when it comes to that!). Easy peasy. This is an amazing top. I love love love love drape necklines. Did I mention I love drape necklines? I usually have to wait for them to be in fashion or buy them via mail order. Now I can make them whenever I want!! Hooray. This took me about 90 minutes to sew. And that was mainly because I had never used my new overlocker to sew stretch and I had never used invisible elastic – so I had a few tests on scraps before I tackled the ‘real thing’. Maria Denmark – Day to Night Top. The ‘night’ shot. My fabric is a little sheer in this light! Could not be happier with this project. And it’s about $5.50 on Craftsy at the moment. Stop reading now and go and buy it. Consider it a Christmas present to yourself. And if you think I am high on Christmas spirit – well Scruffy Badger is too. Either we are both mad or just switched-on stitchers. I’m going for the latter – how about you Winnie? Winnie has put sleeves on her’s – clearly my current weather doesn’t require sleeves. 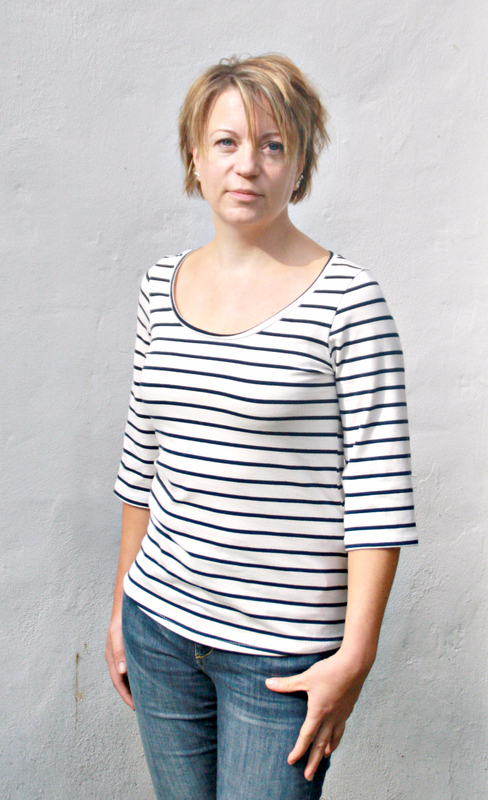 But if you have Maria’s Birgitte tshirt – the sleeves from that fit onto the top. Genius. I used invisible elastic on my top. I could only find white or black foldover elastic at ‘my local’. I tested the technique on a scrap before I sewed the ‘real top’. Maria Denmark – Day to Night Top. The daytime top beach outing – that’s me! I’ve had the rather challenging life lately. Life seems to be a slow-motion avalanche swamping me at the moment. In the midst of my less-than chillaxed life, sewing has been a real refuge from the onslaught of reality. In the past couple of weeks, I have made a gorgeous new Alma blouse (yes pictures soon, have patience people! 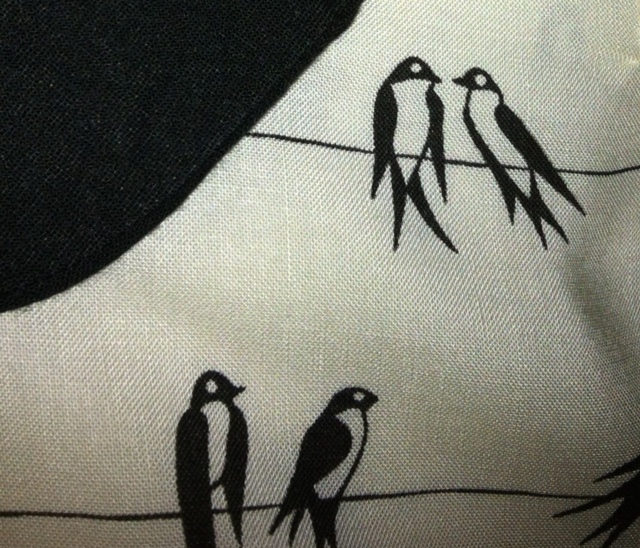 I have provided a sneak peek above) and a muslin for MariaDenmark’s new trousers. Maria and I met through Twitter and it’s been fabulous. She’s got me to sew an a-line skirt (in fact I’ve made two I just have not had a chance to take pictures due to the life avalanche – which I have been feeling very bad about), a t-shirt and now trousers. Maria sent me her trousers pattern just before it was released – to test instructions, notches etc. Life shortly thereafter delivered a quite spectacular landslide and they took me a little longer than usual. However I’ve finished my very rough muslin. The fabric only cost me $4 and it’s a polyester twill – which sounds horrid but it’s got an excellent drape. Given my first Thurlows I thought it best to be cautious with my cash! Maria’s new trousers are wide-legs. Despite my love of hussy-length skirts, I have always adored wide-leg trousers. And these are perfect. I can’t wait to find some nice fabric and make them again! The junk trunk is happy. Please excuse the appalling pictures taken on the iPhone at 11pm! And the unironed pants… and I’m standing slightly lopsided… and they are unhemmed! These trousers have just 12 pieces – compared to the 21 pieces for Sewaholic Thurlow. Now I really like the Thurlows but the simplicity of Maria’s design appeals to me – and I love the fit. I took my sides in a tiny bit too much and will add belt loops next time. Maria directed me to a Threads online tutorial for doing the fly front zipper and it was magic! Life changing stuff! My fly front zip went in perfectly! And my Apronalong prize arrived today! Thank you Karen 🙂 x I love it – even the wrapping paper/bag! This weekend’s #sewingsocial got me thinking. About sewing, about being busy. And about managing all those things (It was ironic that I had to stop scrubbing the kitchen floor to participate). Busy is a catchcry of today’s world. We are all so busy (or in my case sew busy and so busy!). I personally don’t think I’m any busier than anyone else. Or that the things in my life are more important or demanding than anyone else. I think it’s all about perspective. The things that we do in our lives are important to us as individuals and make us who we are – our values, priorities and ambitions. I often get asked how I manage everything. I don’t know, it’s just how my life is and I just get on with it – not much else to so about it really is there? I get outta bed (some days more reluctantly than others) and just plod my way through life. I have a fulltime job. I am married with two children. I don’t have a cleaner for my house. I cook our meals, we rarely have take-away. My kids do after-school activities. I squash in a weekly grocery shop. I have a high-maintenance dog. I sew. I blog. I tweet. My husband has one night out a week at ‘boys night’. We go to Sydney to see family now and then. Not spectacular but it’s busy all the time – like most people’s lives. I often don’t sit down until after 9pm every night and I’m back up at 6.15am. In the midst of family dramas, workplace upheavals and sick children, sewing provides me with a centre. When I sew, trace patterns, cut out, it’s almost like the world’s chatter shuts up. I think ‘suffer’ from the ability to have a very singular focus, I am VERY goal-driven. So doing something completely unrelated to the demands of my life actually means all that ‘essential’ life stress disappears for a time. I am only listening to the pattern, the fabric & thread, the hum of the machine and the hiss of the iron. It’s something I’m choosing to do. I can stop sewing at any time and there is no yearly review, letter to the editor, customer complaint, call from the school, no heart attack, no sick child if I stop. I think if your hobby stresses you out – you need to get some perspective on it. Does it matter if you do a blog post today? If your zipper is a bit wonky? Your bound buttonholes need some work? Not really. Chillax peeps. It’s just fabric, thread and a few notions. Just enjoy it for what it is. Pretty stuff, fresh challenges of your choice and connecting with like-minded people. We have a winner of the MariaDenmark Birgette tshirt giveaway! Sorry you can’t all be winners as I love you all dearly – but I will have another giveaway soon I promise (cos I’m feelin’ like Santa tonight and think it’s a noice feelin’). There were 32 entrants in all, thank you so much for your interest and enthusiasm. 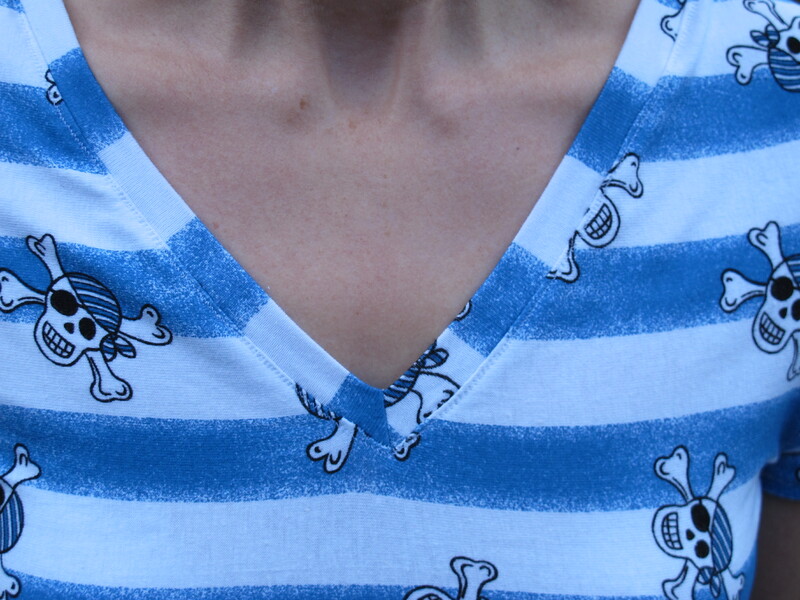 Thank you for all your kind and supportive words about my somewhat questionable taste in pirate-y t-shirts 🙂 Be warned I have more skulls in my stash… ahoy! But more so, for your interest in MariaDenmark and trying out a new indie pattern designer. Let’s support these great individuals with the skills, creativity and courage to get out there and design stuff for us! For those of you who haven’t won, jump over to Craftsy, PatternReview or ShopOnion and snap up this great buy – you can download it ASAP – and who knows? There may be a world of SewBusyLizzys running around when I wake up tomorrow morning in Australia. Yikes! Now that’s a scary thought – sewing machine all around the world are cringing in terror right now! 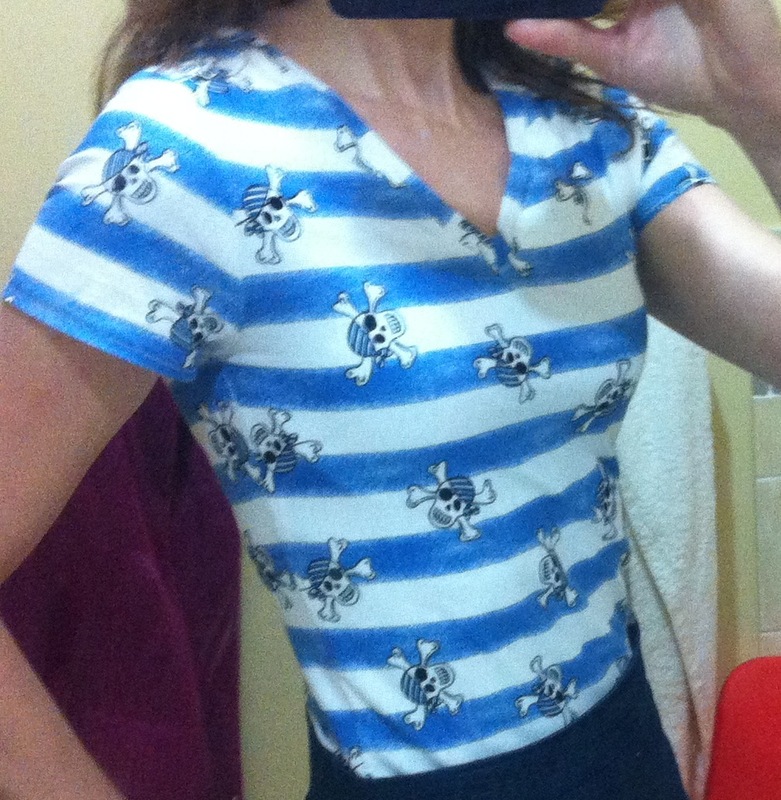 MariaDenmark Birgitte Basic T-shirt – my ‘ahoy-me-hearties’ short sleeved t-shirt for the weekend Mum. Not a great picture – just finished a four hour car trip and ‘ballet mother’ duties! Also pictured my trusty Vogue 1247 skirt. Here’s my new kooky little t-shirt – it’s the Birgitte Basic T-shirt by MariaDenmark. If you are on PatternReview you have probably just got a newsletter announcing you can get it there! And here it is 🙂 a sneak peek. One of the things I have loved most about getting back into sewing, is my little blog and all the online stitchers that I have ‘met’ as a result of my blog, Twitter feed and Flickr. It’s really quite amazing – a few months ago I had no idea the amazing online sewing community existed and now I find it hard to imagine daily life without all the comments and online chatter with my fellow stitchers from all over Australia and the world. Your friendship, advice and humour is priceless. Recently I ‘met’ Maria online – during a Tilly & the Buttons tweet meet actually!. I soon discovered Maria was also a pattern designer. Then I got a message from Maria asking me if I would like to try her Birgitte Basic T-shirt pattern and host a little giveaway. (lots of happy hand clapping). Now I’m guessing you are from Denmark… correct?Completely. Born and raised, and I’ve never lived anywhere else. I want to though, at some point. I was born in Copenhagen and have lived there most of my life, but 8 years ago we moved to the countryside a good 45 minutes away from central Copenhagen. The kids were small then, and it was great getting a house where they could play in the garden. Now that they are big (both are teenagers) we’d love to go back to the city! How long have you been sewing and who taught you? I remember borrowing sewing magazines and books from the library when I was 10 and reading them while dreaming of all the wonderful creations I could make, but unfortunately we didn’t own a sewing machine, and I had to wait until I was 15, when I finally got my hands on a very old and used Husquarna machine. I did have sewing in school (we have an obligatory subject called textile crafts in grade 4 and 5) but the teacher was very old fashioned and wanted us to take ages to make a pillowcase (doing hand-basting etc). She killed any creativity and joy there might have been in class. So in conclusion. Nobody really taught me (and it showed!). What are the things you remember most clearly about your early days of sewing? I know this is a strange answer, but when I read this question this is what comes to mind: An image of me cursing and fiddling, trying to get set-in-sleeves to behave. This was a t-shirt and yet the sleeve cap had way too much ease and the instructions told me to set them in in the round. It was a nightmare. (This was of course before I knew about setting sleeves in flat). Also I didn’t know what to do because I thought you had to follow the instructions completely. Like many of us, you have been sewing for many years – in that time how has the sewing world changed? Obviously – the online sewing community (which didn’t exists at all when I started out). I remember finding Patternreview and being so happy that I could chat with other people interested in sewing. No one around here (that I knew, anyway) was sewing. Finding friends (actually, one of my closest friends – Tini – I met through Patternreview) and having somewhere to learn about sewing and somewhere to ask questions was brilliant! Since then, with all the sewing blogs being there, it has become more of an inspirational tour to go online. And also – if my sewing mojo is low, just looking through the blog reader will get it right back. What do you think are the good things about those changes? Well, all of it, but obviously, the market for .pdf patterns opening up is a big deal for me. Five years ago, if I’d wanted to start out as a sewing pattern designer, I would have had to get a bank loan of at least 50.000 Euro – just to start out. Today you just need to buy a program in which to draw the patterns – and that’s more like 2000 Euro, which is so much more reachable. What are your favourite fabrics to work with? I love my stretch knit fabrics. I really do. I like the relatively easy fitting, the fun styles, the easy wear. But whenever I get a chance to work with a woven cotton or a nice wool, I’m always so thrilled about how easy they are to handle, sew and press. Over the years what have been the things you are most proud of (or loved the most)? My first trousers, definitely. Or should I say, the first trousers that fit me well. I went through Pants for Real People (by Palmer/Pletch) and fitted my pattern all alone – only with the help of a camera, the book and all the lovely ladies at Patternreview. I’m also very proud of the bridesmaids dresses I made for my wedding (well, Tini actually made one of them!). We made one for my stepdaughter (who was 10 at the time and plus sized) and for my sister (who was a skinny 15 year old) using the same pattern. And they turned out very nice, I think. The one thing that has been loved the most, was a pair of camouflage elastic waist trousers I made for my son when he was little. He wore them for years and grabbed them as soon as they came down from the clothes line. First he wore them with the cuffs turned up, then he wore them like normal trousers. He grew, and the trousers became knee shorts and shorts, until he finally couldn’t fit them anymore. Are there any fabrics, techniques or styles that you are still trying to master? When did you make the move from being a stitcher to being a designer? I began drafting for myself a couple of years ago, and then realised that I didn’t really know what I was doing. So I took a couple of classes at a community college and then suddenly I realised that I’ve always wanted to design sewing patterns that teach sewing. That was a year ago. You are one of the designers behind shopOnion – can you tell us a little bit more about that? Actually. I’m the founder and owner of ShopONION.com, which is a webshop, that sells Danish sewing patterns with instructions in English. It began a bit by accident, when I was sewing and reviewing ONION patterns on Patternreview (see? Patternreview and the online community has meant a lot to me!) Soon other members asked me to help them get the Danish patterns I used. And shortly after I made an exclusive translation agreement with the designer of the ONION sewing patterns and Dennis (my husband) began programming a shop. And ShopONION was born. Two years ago I was approached by the designer of the MiniKrea patterns (which makes lovely kids patterns) and I started translating and selling for them as well. What inspired you start MariaDenmark? The realisation that is was possible for me to publish sewing patterns (with out the gigantic loan) and the idea to make them with detailed illustrated (with photos) instructions (which is possible with pdf patterns, but tough with printed patterns, as there is always the cost of printing more pages and pictures are so expensive to print) made me want to follow my dream. The name MariaDenmark was my online user name from the beginning, so I thought I would start a transition from Shoponion (which implies that I only sell Onion patterns) to MariaDenmark.com. What’s your design philosophy and what inspires your designs? I want to design patterns for everyday wear with simple lines (much in the Danish design tradition) and a great fit. I want the patterns to have detailed illustrated instructions, to make them easy to sew and fit for everybody – even complete beginners. Basically I want to create patterns that I’ve always needed. Right now I’m inspired by what I wear and what I need to add to my wardrobe. I also get very inspired by current fashion – especially the Danish designers (I love Gestuz, Karen by Simonsen and Malene Birger) and blogs. So what’s up next for MariaDenmark? What are your long-term plans for MariaDenmark (or will we have to wait to find out)? Well. I have actually quit my full time teaching job (but still have a couple of months left) and then I’ll begin my full time sewing career! The details will be revealed at a later time – but there will be a lot of new patterns and also I’ll still be teaching! I’m sure you can do more than sew and design sewing patterns – what other things do you create? I crochet and knit and also love to make old-fashioned soap. But right now it is mostly about the sewing. So when you are not creating, sewing, designing – what do you do? Teach. And plan lessons. I podcast with Tini (The Twin Needle Podcast) and I also enjoy running (I know, I never thought I would say that I actually enjoy it!) and being with friends and family. I have an ecological kitchen garden (which has suffered a lot this year) and 5 chickens as well. I don’t watch much TV, but I read a lot of fiction. I also need to sleep 8 hours per day and I cook and eat occasionally… I don’t clean very often, though. Any final tips, hints or thoughts you would like to share with the online stitching community? I’m so thrilled with everything that’s happening right now in my life. Thank you online stitching community for making it possible! Thank you so much Maria and I certainly look forward to more of your designs! Thank you, Lizzy! This was so much fun! ABOUT THE PATTERN AND THE GIVEAWAY! I’ve actually made two Birgitte t-shirts already! Yes, I’ve been sewbusy. I’m just sharing my pirate t-shirt today – ahoy-me-hearties. I was so excited by my t-shirt when I finished that I immediately took a snap in the bathroom mirror and sent it off to Maria! The Birgitte PDF download pattern comes with pages of instructions complete with photographs to help you along the way – so much easier than decipering the often very brief instructions that are typical of printed patterns. So if you are new to stretch fabrics and t-shirts then this is the perfect place to start. I like the depth of the v-neck on this t-shirt because it’s not too deep and being an Aussie in the hot hot sun, skin protection is fairly important to me. It’s not as loose through the lower body as my other t-shirts, a much more streamlined and, on me, a more flattering cut. One of my friends was immediately impressed by how feminine the skirt looked (yes, even with the skulls & crossbones!). Maria sets the sleeves in flat which makes sewing a t-shirt so much easier than the setting in method. It also makes stripe matching on the sleeves so much easier. And at just $8.95 (no shipping costs because it’s a download!) if you are after a t-shirt pattern with some sleeve and neckline variations this is a great buy. I wasn’t even trying to match the neckline stripes, so it’s a little bit out-of-line but getting it this close with zero effort is very cool. I attached the neckband, flipped it over and went ‘WOW! Miracles never cease’.The fit on me is perfect. If you require some alterations, Maria has done two posts so far on this pattern 1) a full bust adjustment (alas this has never been a problem for me…) and 2) one for a forward shoulder adjustment. Birgitte is a download PDF pattern – so if you want it – you can get it right now! PatternReview (Friends of PR save 10%). As I’m a sewbusy stitcher, the immediacy of a download is very appealing and the cost is much lower than a printed pattern (which of course means you can buy more patterns for the same amount of money!). I work fulltime and have two young daughters who are SoBusy – so having a basic t-shirt pattern is fabulous. I simply do not have time to be drafting my own patterns – that’s time I could be using to sew – I have priorities! For me, the creativity element is putting on my spin on the designs with fabric choices and finishing touches (ahoy!). I picked up this crazy fabric from Spotlight. I’ve been desperately wanting to make a striped t-shirt but have been unable to get anything locally. I found this on the bargain table to Spotlight – clearly it’s not intended for adults – not ‘normal ones’ anyway. There was only a metre left and it cost me the princely sum of $2.50. I decided to throw caution and good taste to the wind – and accept that if I wanted a striped t-shirt this was my big chance! Miss 9 (now to be known as TFP – The Fashion Police) advised me that I was going to ‘look like a 7 year old boy’ and made no secret of her distain. Now it’s finished, TFP has admitted that ‘it’s actually quite cool’ and if I get tired of it – ‘could you give it to me please’. So where is my second Birgitte? It’s finished – and ELH (ever-lovin’ husband) said it looks ‘just like a shop one’ (which I took as a compliment). I want to have a go at painting stripes on it – I’ve been obsessed with this idea ever since I saw Tilly & the Buttons do it – and my new white ‘looks-like-a-shop’ 3/4 sleeve scoop-neck white Birgette is the perfect candidate for this project – I’ve just been out of town for the weekend so I haven’t finished!! But Maria’s got one on in her picture above! And the pattern provides a long sleeve version too! HOW CAN I BE JUST LIKE YOU LIZZY? I get asked this question constantly (bahahaha – NOT). I will pick one lucky commenter on this post to walk the plank…. oops, no, no…. to receive MariaDenmark’s brand new Birgette Basic T-shirt pattern. Woo hoo. It will be a lucky draw and I will draw it a week from today (next Tuesday night Australian EST) – yes I know you can hardly wait! Don’t forget to support our independent pattern designers. Remember they are the ones putting themselves out there and providing us with bread, cake and frosting patterns to fill our wardrobes and our heads with new ideas! Thanks for making it through the long post! !